Ria Nabalan isn’t the typical superstar. Meet her for the first time and she’ll flash you a reserved smile, shy away from the microphone, and ask if you’d rather speak to her other NU Lady Bulldogs teammates. Meanwhile, her teammates are her hype women—telling her to just speak, cheering her on, calling her amazing. Which she absolutely is. 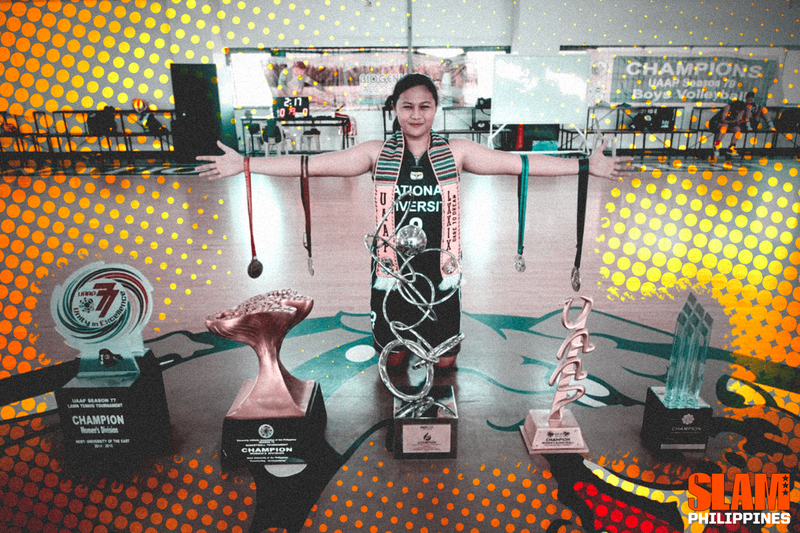 Nabalan isn’t just a UAAP champion. She started her career as Rookie of the Year, and ended it with having won five rings in five years, as part of the Lady Bulldog’s historic 80-0 streak. And while other players lay claim to portions of that success, Nabalan was there for the entire streak. She graduates without having lost a single game. In those five years, Nabalan has shared the court with NU legends Afril Bernardino and Gemma Miranda, as well as current stars like Finals MVP Jack Animam. 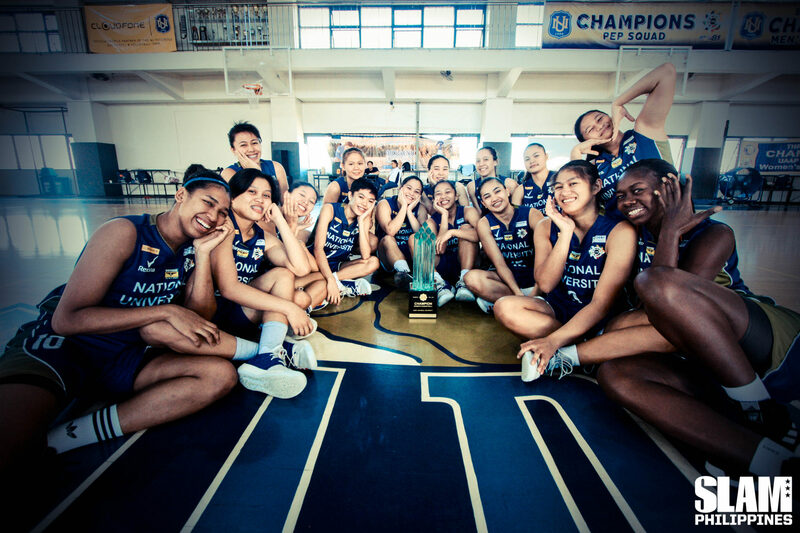 Their dominance has extended even beyond the regular season, with Nabalan crushing the recent UAAP 3×3 tournament with Animam, Monique Del Carmen, and Rhena Itesi. In the game where they tied the 73-0 record of Adamson’s softball team for the longest streak in UAAP history, Nabalan was on fire with 31 points including seven triples, seven rebounds, six assists. “Noong 1st year ko, andoon lang ako sa seniors ko para umalalay. Pero ngayon, ako na mismo ‘yung magtuturo at magle-lead para manalo,” Nabalan says. Nabalan got her start when her dad taught her how to play in grade three. The next thing her dad knew, he got word that his daughter was skipping class to play ball. But for all her love for the sport, she had no idea of the possibilities for women in basketball. The varsity basketball team in her elementary school was for boys, not girls. There were no basketball camps for girls in her area, either. When they’d watch the PBA or the NBA, it was always men. She had no idea that UAAP even had a women’s division because the only televised games were then men’s. The first time she joined the varsity basketball team was in high school. The first time she saw a women’s game on TV was the year before she went to college. “Noong namulat ako na may mga babaeng nagba-basketball, naging idol ko sina Alyanna Lim,” Nabalan says. Good thing she was recruited by Chiang Kai Shek for their high school program. Good thing she said yes, and finally received the intensive training she needed. Good thing Coach Pat Aquino recruited her after seeing her play in Palarong Pambansa. Good thing NU invests in their women’s basketball team. If not for those turning points in her career, we might not have seen her complete that incredible 80-0. You’d never hear those kinds of stories from her male counterparts in the UAAP. Theirs are stories of systems, of how their parents enrolled them in camps, regional selections, private lessons. Even the least impressive player on the least impressive men’s team has that background. Nabalan, like most girls who play basketball in the Philippines, did not play on an equal field. But here she is, 80-0. And her success is even more admirable when you think of the odds that were stacked against her. “Siguro kung mas maaga kaming nakapanood ng WNBA o UAAP Women’s, mas napaaga siguro kami nahilig sa basketball,” Nabalan says. Her dream for women’s basketball is regular TV coverage, more media features on her fellow athletes, more brands willing to sponsor them—and not just when they win 80-0. She wants consistency, not only for their sake but for the sake of young girls. Nabalan also urges companies to invest in semi-pro or professional leagues where women like her can keep playing after college. For now, she’s thinking of joining the Navy—the same path that the likes of Trixie Antiquera and Andrea Tongco have taken. Not only has she dreamt of being a soldier, it also comes with one important perk: she can play basketball for their team. No matter where her next journey takes her, the quiet superstar will always treasure her incredible run with the Lady Bulldogs—a sisterhood built on overcoming challenges and fighting not only for the titles, but for gaining recognition for women’s basketball in the Philippines.